We love the Macdonald Resort and have visited several times. The child-friendly facilities such as the Lagoon Pool, softplay, inflatable zone, full size cinema and numerous scheduled kids activities are really superb. The resort is a nice size, big enough to spread everybody out but nothing is too far apart to walk to. There’s also so much to do for families in and around Aviemore – it really is an ideal family destination within Scotland. Ask them about their current all-in Family Packages. We most recently visited Aviemore in March when the mountains were still covered in snow but the roads were clear – which for non-skiers like us is pretty perfect. Twenty years earlier, when we were kids our family used to drive the three hours north to Aviemore once a year and since we’ve had young children of our own, we have restarted the family tradition. The Macdonald Highland Resort contains four Hotels and 18 Luxury Lodges catering for different budgets. The Academy Hotel has family rooms from around £72/night and sleeps 4, whereas the Aviemore Highlands Hotel has rooms from £114/night. The Luxury Woodland Lodges are £270/night. We have stayed both in the family rooms at the Academy Hotel (with 4 beds in one room) and also the Macdonald Highlands Hotel. The Highland’s Hotel is much smarter, with a fine dining restaurant whereas the Academy Hotel is not so smart, noisier and has a TV lounge. The kids can charge around here and nobody minds if you turn up in wet skiing or walking gear. There are four restaurants on site varying in price but families with young children will almost certainly end up in Giovanni’s. Giovanni’s is a standard pizza house with plenty of choice. The staff were superb with the children and the restaurant is well prepared for worn-out young kids. They serve up soon after ordering and nothing is too much trouble. Aspects Restaurant is fine dining and obviously more expensive but the staff here are also brilliant with kids – though to be honest we were certainly much more self – conscious here about disturbing other diners without children. Set up specifically for families and is perfect for all ages. For our family, the first destination is always the swimming pool and the pool here is really superb – especially for young children. Its shape is fun and it has a very large curved shallow area for littlies which prevents that bunching effect of many pools, when families are all crowded into one end and the deeper end is almost empty. 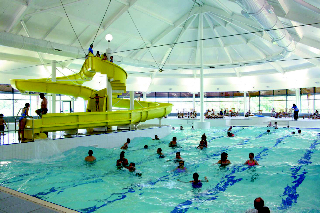 Beside the pool is a brilliant soft play area which is large and imaginative with a decent well situated cafe where you can keep an eye on the children both in the soft play or if they are old enough, the pool as well. The other facilities we enjoyed the most were the Fun Factory. The Fun Factory is basically the hotel’s conference room jam packed at scheduled times of the day with funfair style inflatables and games. It’s absolutely brilliant and the kids will love it. It’s has nursery staff so you can even leave them there if you want an hour’s quiet time in the Spa by yourself. We also enjoyed the resort’s cinema – which is a regular sized cinema – to see How to Train your Dragon. This hotel couldn’t be more prepared for a rainy day. Since we visited, the resort has now employed a dedicated children’s entertainer who has a range of activities planned. From the Aviemore Adventure Kids Club with creative crafts, games time, puzzle mania, dance workout, karaoke, keep active and a talent competition to the Aviemore Children’s Time Workshop with Mask making, arty crafts, High School Musical Song sessions, dancing divas, face painting and more. There is also Aviemore Children’s Fun Time with fun games, cinema club and WII competitions. Evening entertainments for older children (because younger kids are unlikely to be awake past 7.00pm after a day spent here). Evening entertainment includes discos, race nights, quiz nights and bingo. Obviously Aviemore is even more amazing if you love skiing too!